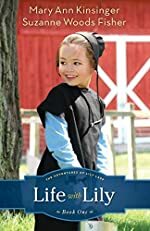 Review: I read a book called Life with Lily by Mary Ann Kinsinger and Suzanne Woods Fisher. It is book one in The Adventures of Lily Lapp series. The main character in this book is an Amish girl named Lily Lapp. This book takes place in an Amish community in New York State. Lily is six years old and has two brothers, Dannie and Joseph. She is also part of a big extended family including her aunts, uncles, cousins, and great grandmother. Half of the family lives in New York and the other half lives in Kentucky. The book follows Lily through her daily routines on the family farm. It is made up of various short stories about Lily's school, life at home, friends, love of animals, and family. Some of the events described are Lily's birthday, her visits with relatives and friends, and the family moving to Pennsylvania. At the end of the book, Lily's family decides to move to a new house in Pennsylvania so that Lily and her brothers have a good place to go to school. One thing I liked about this book was when Lily's grandmother taught her about how important it is to choose your friends wisely. She gave a good example by putting white flowers in water with different colors of food coloring mixed in. She compared the colored flowers to flowers in clear water. However, there also were some things I didn't like about this book. For example, the characters are more or less static and do not change much throughout the book. Also, most of the short stories did not connect to each other, although they were in chronological order. The theme of the book was ineffective and could not be easily picked out from the text. There was no main plot in the book. The authors of the book have a slow-moving writing style with ideas that aren't well-developed and had few details that could let the reader picture the events. I did not like this book because it was boring, had sketchy ideas, and was not very descriptive.